The sheeple herders who control the Concentrated Sheeple Feeding Operations of the Western Civilization Franchise, have decided that their most favored practice to manage the vast herds of Western sheeple is to repeatedly import a multitude of differing Sheeple Breeds from all the other feedlot franchises found at other international locales of the multi-national corporate conglomerate, colliquially known here at this outpost in the fever swamps of teh Interwebz, as our Brave New World Order Inc.
By constantly adding a steady influx of various breed stocks of differing heritages and genetics, the slow-motion process of mass mongrelization over multiple generations of the entire herd stock, is doing it's intended purpose of general herd pacification by reducing potential pockets of resistance from coalescing around common cultural social and/or racial bonds to more effectively resist their operations. Disjointed, disconnected, dysfunctional, atomized human resources that have no common grounds to bond and communicate with each other, bereft of a common family and culture, trends towards an improvement in conditioned sheeple stock that are more likely to graze compliantly for a lifetime at the feedlot's troughs of agriculturally engineered feed to fatten them up for eventual harvest day. While even the most miscegenated mongrel can potentially wake up to the reality of our existence and go off the reservation, most are easily kept in line and complacent by bombarding the herds with incessant messages via digitized media, promoting homogenized mass culture, all based on the cardinal virtues of corporate consumerism, degenerate morality and spiritual degradation. THEY use advanced modern technology to incessantly disseminate such regularly scheduled programming to all the inhabitants of a feedlot operation this vast. To control so many sheeple's minds amongst the enormous herds; to keep them happily confined and unable to comprehend potential emancipation from their machinations; these sort of operations requires the best media system fiat usury money can buy. THEY create as THEY speak. THEY tell us that we must accept multiculturalism as the ultimate moral good...that mass migrations of foreigners with different cultures, values, religious beliefs, morals, and even vastly different standards of hygiene and cleanliness, are GREAT for us all, and will help us achieve the glorified vision of a peaceful utopia where all divisions and differences are consigned to the dustbin of history. Sure there may be some growing pains and a protracted adjustment period....but have no fear, our vibrant future of perpetual progress is within our grasp! To stand in the way of this is akin to being a Nazi...and everyone knows being a *Nazi* is the worst possible designation one could be identified as! 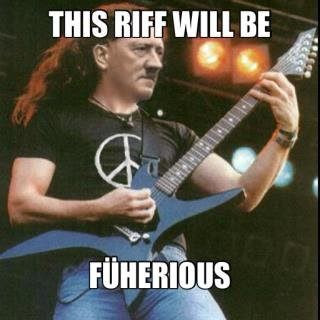 The riffs may change, but the song always remains the same. For you see, THEY are telling us the simple truth, thereby effectively hiding it in plain sight. When THEY say OUR STRENGTH, we the 99%, got nothing to do with it. THEY are simply referring to the exclusive group of shareholders and board members of Brave New World Order Inc. You know, all those 2B2F members of the Usury Industrial Complex. 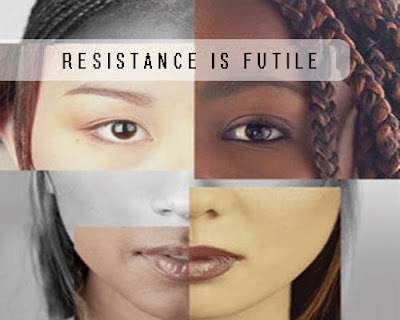 By making us all vibrantly diverse, mixed up, miscegenated and mongrelized, their own solidarity and undiluted culture of top down control remains unchallenged and ignored as we are perpetually divided, re-divided, conquered and re-conquered over and over again. 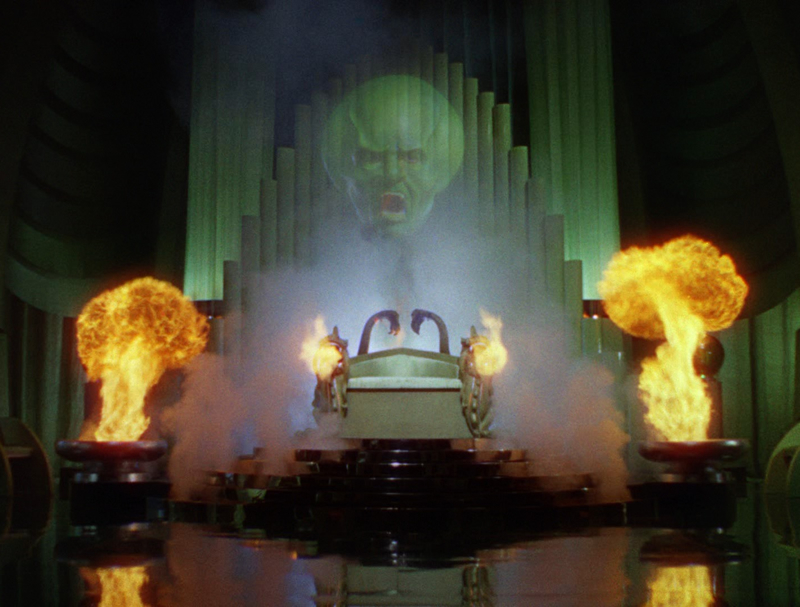 By this point, some may be wondering how a miscegenated mongrel proud of his mixed heritage and ethnicities in the 50th franchise of USA Inc., out here in the middle of the Pacific, gets off on blogging about a perpetual influx of distinctly different cultures into an overrun homeland. It's all about the politically incorrect topic of HBD. It 'aint just happening in Europe and the Continental USA, folks. The American Dream...available for all except present Americans!! You will see it on all our social media NSA data harvesting apps, and you will hear it if you travel around our State and listen to what local people are talking about in regular conversations when they discuss the continued influx of COFA-enabled migrants from Micronesia into our islands. While our media and our politicians repeatedly implore us all to "live Aloha" and to never forget "we are all descended from immigrants ourselves" to get us all to ignore the negative impact this recent influx is having on our State, the realities on the ground are nearly impossible to ignore. Hawaii is often described as the most diverse and multi-cultural melting pot in the entire nation...that we are a role model of how the rest of the West should become. 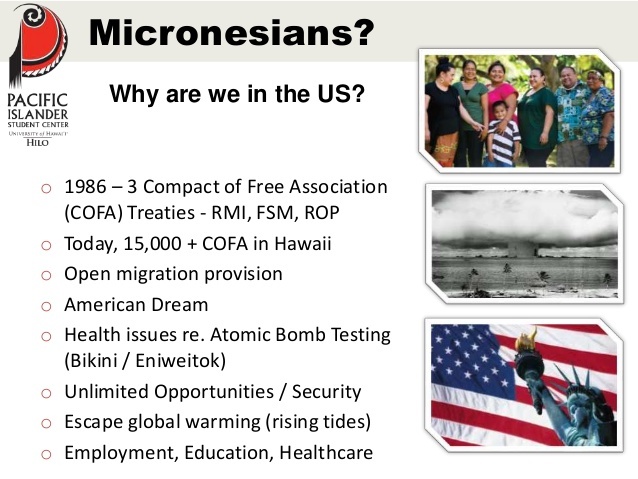 We have welcomed millions of people from all over the world to make a home for themselves in Hawaii, and we currently have generations of descendants of migrants to Hawaii who consider themselves "locals" born and raised. 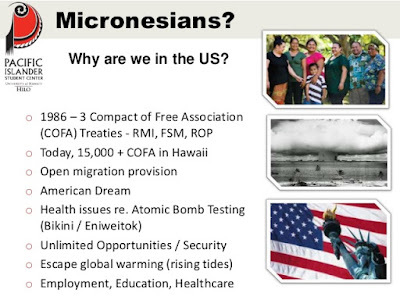 And while many of us descended from the aboriginal Hawaiians chafe at minority status in our own native homeland, we by and large accept most of those non-native descendants who were born and raised here as "local" as most have somewhat assimilated to the "Aloha Spirit" ideal. But we are seeing more and more migrants that come here who don't attempt to assimilate to that and bring their own values and traditions and practices, and they are conflicting with our own in a myriad of ways. Just the other day, I was at the beach and I heard a conversation in which an old Hawaiian fisherman was angrily denouncing the "cockroaches" (the street slur of choice locals use to refer to Micros) he has been observing who come to the shoreline he was born and raised on, and has fished at his entire life. He was livid that they have been rapaciously fishing out anything and everything they can catch. He angrily told the small group of people he was talking to, that he had recently observed a group of Micro men using chlorine bleach on a full moon night to kill whole schools of fish on the reefs just offshore, and when he called the Police to report it, no officers bothered to come and neither try to stop and arrest them or even get a post-crime report from witnesses. Traditional Hawaiian fishing culture has always had an emphasis on catching only what you need, releasing undersized and juvenile fish to replenish the population, so as to always have fish for future generations. Using environmentally destructive tactics like bleach on the reefs is certainly anathema to everything Hawaiian cultural practitioners stand for. Apparently these foreign islanders have no such compunctions...either because Hawaii is not their ancestral homeland, or such practices don't affect their own island fish populations. Hawaiian Green Sea Turtles have been on the Endangered Species list for decades and are illegal to catch and eat. 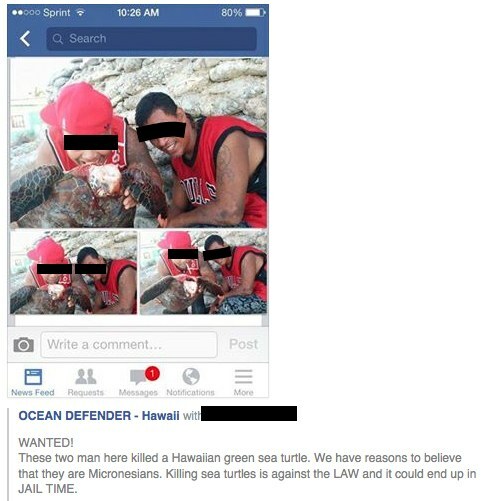 Despite a long native tradition of catching and eating turtles, Hawaiians nowadays no longer do so. In recent decades, the turtle populations have been rebounding in the waters around our islands, but they are still considered endangered and protected by law....but our newest migrants only see free food for the taking. In other instances, it seems like in the past six months, no matter where I go (my work takes me all over the island to many different towns and communities), I invariably encounter people discussing the impact the COFA-Micro migrations are having on my island home. All of the familiar complaints US Mainlanders have for Mexican and South American illegal immigrants spreading crime, taxing public services, using up resources and flooding the job markets with cheap labor all apply to the situation with COFA-Micros here. Despite the manufactured narrative our Government Media complex has been relentlessly pushing to keep us pacified in the face of this newest mass migration, more and more people are noticing the undeniable impact this large influx of foreigners are having, and are increasingly beginning to speak up in public. Now granted Hawaii's growing population of imported "cockroaches" are causing nowhere near the same problems the muslim immigrants are causing in Europe and the US Mainland. While we are having an increase in property crimes, environmental degradation and increased homeless encampments full of these COFA-Micro migrants, it is still nothing like the mass rapes and murders we are seeing in the EU by the "rapefugees." But I make mention here to illustrate to those who still refuse to recognize what is going on at an international scale. The One World Government agenda is on the march, and mass migrations and miscegenation of all the world's populaces is progressing at an accelerating rate. All of our nation's governments that are overseeing these mass migrations are colluding in this world-wide devolution into Babel-style chaos. And yes, I can readily concede that it does appear to be a bigger effort to wage war against White people and White-founded civilizations. The goal of #whitegenocide and mass miscegenation is certainly real and being blatantly promoted by an international crime syndicate that has subverted our world nation's governments and THEY are patently bent on corrupting all of the world's native cultures. I'm just endeavoring to point out that this is not solely confined to black-brown-and-yellow-on-white crime. The exploding popularity of the Trump campaign to build a wall, halt immigration and deport the illegals merely indicates that the WASP American descendants are finally waking up to what is going on...but I'm only pointing out here Paleface, that you are not alone in your current tribulations. The New World Order is working to eliminate all borders, nation states and nationalist cultures and ethnic identities. And while the current focus seems to be white genocide, especially in Germany, those of us who are not of predominantly of Paleface ancestry should take heed and note that THEY are eventually coming for us all. My country was my home. Now its a hotel. And they want me to be a waiter. NO. ONE Problem: AFRICA FOR THE AFRICANS, ASIA FOR THE ASIANS, WHITE COUNTRIES FOR EVERYBODY IS WHITE GENOCIDE!! That is the crime. It is white Genocide. It is state violence. Politicians past and present must be held accountable. 'Just obeying orders' is not an excuse. The West is a culture created by a specific people and it will be destroyed if that people is dispossessed. Europeans everywhere have the self-evident right to secure their homelands for themselves, without regard to the claims others make upon it. Nobody's flooding Africa with Non-Africans and giving them free health care, affirmative action and special privileges. Only White Countries are doing it, only White children are affected, and only White politicians are allowing it. Diversity is whose strength, exactly? Don't you think also that immigrants are also destroying themselves by moving from home to another country? It is not the natives who are also being destroyed. "It is not the natives who are also being destroyed." Correction: It is not only the natives who are being destroyed. Nestor, it probably varies a lot. People who colonize rather than assimilate, so to speak, may pretty much remain as they always were. Different groups who have moved to the US have varied a lot that way. Both by ethnic group and by when they came. Most Germans turned into American types almost immediately. The Amish changed hardly at all. 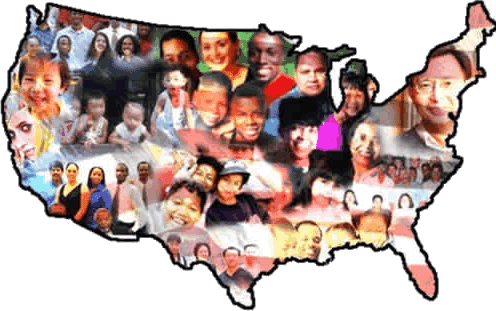 As far as I know, all my relatives who migrated to the USA and elsewhere have dissolved into the new country and have forgotten about their original ethnic belonging. Not to forget, that the USA is already a mixture of various peoples. 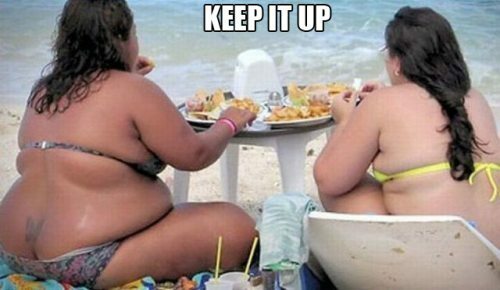 Oh its even worse than you believe. "They" are not pure at all. "They" are the most mongrelised and unrecognizable strain on Earth. I'm not sure they're human, as they are anti-social to the point they even despise their own families. Their way is that their maternal parent or mother must be their race, but the father can be anyone and anything. Strangely, the other way with only the father makes you an outsider and not "real" to them. This is highly unusual, and they would be the only humans to do this I've ever seen. All other races determine race by their father. Also, the belief this is all part of a plan is not entirely true. Some of the tactics used are in the Protocols but their behavior suggests pathology rather than strategy. Strategy would vary based on environment and target population, but I see no variation in their behavior regardless of location. They are parasites. Like parasites they infiltrate, take control of government media and culture, and then feed on the target population. However, they are so paranoid, that not long after assuming control they attempt to genocide and exterminate their hosts. They do not act or seem human, they are more like Vampires or parasitic pathological killers. They are indeed coming for all of us, not just Europeans. Check out this video clip featuring Frans Timmerman, the Vice President of the European Commission. He doesn't just claim that Europe must become diverse, but that every country in the world will eventually suffer the same fate. These two doesn't even care if it is endangered or not!